Perhaps I’ve internalized my hippie methods enough by now that it is second nature for me to throw my veggie scraps into a bag in the freezer, or into my worm bin or compost failing that, but I think it should feel weird and wrong to throw perfectly useful things away. 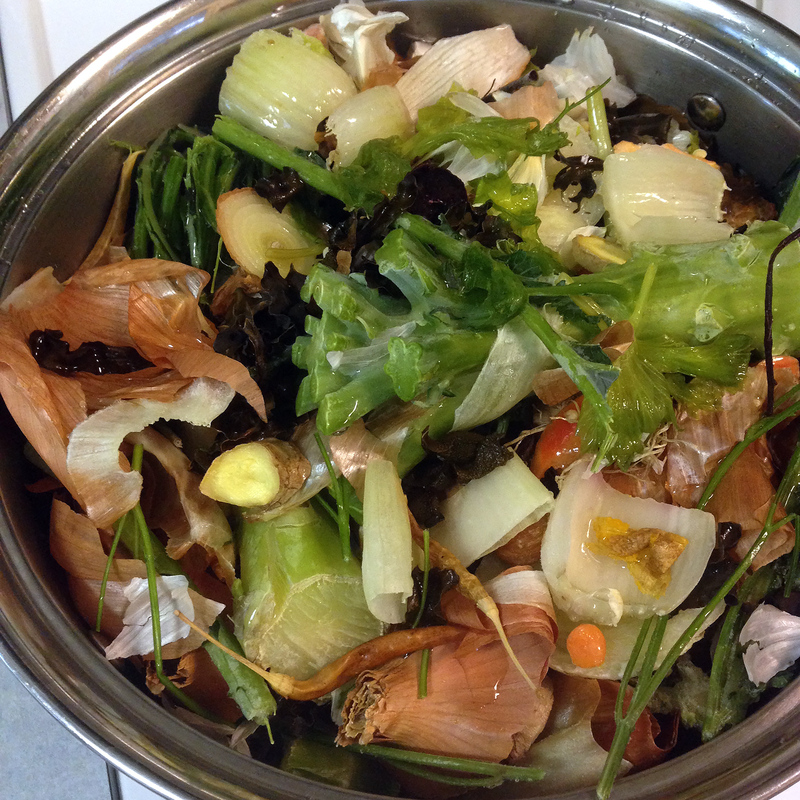 There are some very simple ways to make our lifestyles less wasteful and more sustainable, and many of them are as simple as asking “what would my grandma or great-grandma do?” Saving veggie scraps to make vegetable broth is one of those things that I am pretty sure would make my granny proud. Plus, homemade broth is SUPER healthy and nourishing. Free food makes me happy. Reducing food waste and using every last bit of every resource you have does too. So when I realized how easy it was to make veggie broth from little leftover bits of vegetables, I kinda wanted to kick myself for not starting the habit sooner. Here’s how it works: get a big gallon freezer bag or two. As you cook, save the ends and skins of onions and garlic, pepper innards, tough ends of broccoli stalks, root veggie peels and ends, ginger and carrot peels, celery ends, parsley and cilantro stems – any clean but unused plant matter that would add good flavor to broth. Add these odds & ends to the bag as you’re cleaning up from cooking and throw them back in the freezer. Once the bags are getting too full to close easily, empty them into your largest stock pot and add filtered water until it reaches the level of the veggies, leaving a few inches of space for it to boil. I usually throw in some healthy additions at this point: dried seaweed, a bay leaf or two, a few chunks of fresh turmeric and ginger, peppercorns, a handful of flax seeds, maybe some dried mushrooms or hot peppers, and whatever spices I feel like adding. Stir it all into the water and let it come to a rolling boil before turning the heat down a bit. Boil your veggies for a good 20-30 minutes at a low simmer, stirring occasionally and adding water if necessary. I usually cover my pot with a lid but make sure it doesn’t boil over. I rarely have a timer on, I just let the veggies simmer while I am home and busy for an afternoon, and check on them every so often, turning the heat down a bit more as they start getting mushy and faded in color. Once everything looks pretty mushed out, I turn off the heat, cover it tightly and let it all cool completely, sometimes letting it sit overnight. Once the pot is cool, it’s time to strain. This is where it gets tricky. If you have a large ladle, you can ladle broth over a strainer into jars for storage. Or you can pour the broth from the stock pot into a large bowl or pitcher, and then into jars. I freeze a few jars (make sure to leave an inch or two of space) and put the rest in the fridge to use within a couple of days. Great for soups, risotto, or just drinking hot by the mugful as a cleansing and nourishing tonic. Every batch is a little different and it’s easy to adjust the seasoning to whatever purpose you had in mind.